This Cinco de Mayo, why not skip the janky taqueria inauthentico at your local strip mall and hop on a plane headed due south? There is really nothing quite like celebrating another country's holiday by traipsing around their national treasures and then enjoying one (or four) cold bottles of their unofficial national cocktail. If drinking on the go isn't your top priority this Cinco de Mayo, you're probably celebrating the wrong holiday. Cayman Jack's all-in-one, better-than-average bottled margarita is portable, and won't get in the way of you running Rocky-style up the steps of Chichén Itzá. Why is everyone in Tulum doing so much yoga? Because they are beautiful, beautiful people, who come to the Yucatán peninsula for fresh seafood and juices, and to Instagram their toes in crystal clear water. Namaste, you know? They're staying at The Beach Tulum hotel, where they rise every morning to ocean breezes gently blowing across gauzy white sheets in their straight-to-the-beach suite. Maybe you'll lock eyes with one of them while snorkeling the famous cenotes. after whiling away the evening making out in an underwater cave, reemerge for some light sustenance. Surrounded by such beauty you won't even notice the excruciating wait for daintily-arranged, on-trend ceviche — which was, of course, totally enough food for you. Or more realistically, you'll just take your super-cool rented beater down the road a tick to Akumal for fish tacos and homemade ice cream. The town is famous for its seafood, and after some tacos and a cold marg you'll forget all about your sunset yoga class. Evidently the Beat poets liked to take far-flung Mexican friend-cations — why not follow their footsteps down the narrow, sprawling, and winding streets of colonial San Miguel de Allende? You're not going to fall asleep on the train tracks à la Neal Cassady, though. Instead, take to the canyons outside of the city to visit the Cañada de la Virgen archeological site, where you can convene with your inner hippie by walking amongst the pyramids and visiting Casa de los Trece Cielos, a lunar clock. Then, you can take to Coyote Canyon for a trail ride — just don't make a fool of yourself by falling off into a patch of cacti. 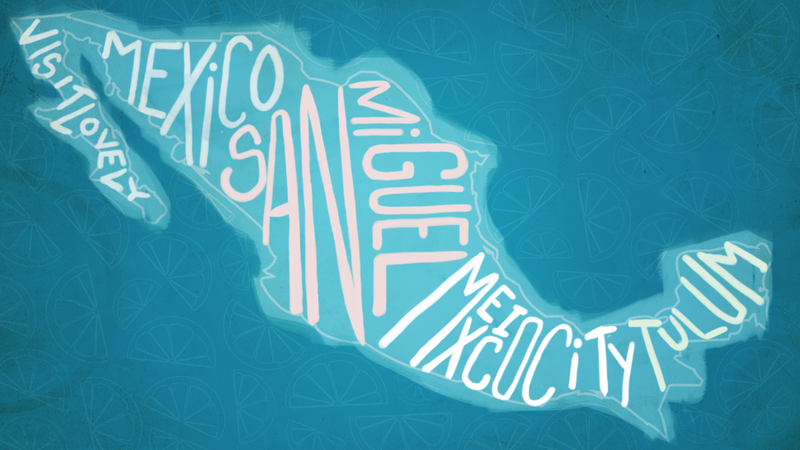 San Miguel is a popular jet-set destination for Mexico City socialites, who swarm a handful of glitzy restaurants. You, however, know better than to spend more than three USD on dinner. A piping hot gordita or torta de milanesa from the Mercado Ignacio Ramirez flea market should do the trick — and will stabilize your equilibrium before you dip into the thermal springs that dot the local hillsides. Mexico City — aka México D.F. (Distrito Federal) — is the largest metropolis in the Western Hemisphere, home to 20 million residents, living in over 350 different neighborhoods. Suffice it to say, your chances of getting lost in one of the city's thousands of floridly named streets — Forest of Light, Garden of Memories, Mirror of Water — are way greater than, say, running into Juan Manuel Marquez in excruciating traffic. Except for the traffic part. There's a way to enjoy getting lost. You have to limit your radius a little, by picking a short list of neighborhoods to haunt, like the epically floral Coyoacán (place of coyotes!) where you'll sneak around Diego Rivera and Frida Kahlo's home/studio and can stay in a house built by the same architect for less than most urban hotels. DF is a food town and — yeah, that includes an upswell of American media clatter-worthy restaurants, there's also a lot to be said for street meat, like tlacoyos and anything al pastor or barbacoa. Whatever grilled flesh you choose (hint: just choose all of them), you can pair them with a cold margarita — always winning decision. The idea is to treat Mexico with the same level of top-notch reverence with which we treat our own country: eat something that was cooked outside, light something — anything — on fire, and make sure your loyal sidekick is a beverage. For more information on Cayman Jack bottled margaritas, head here. Zinzi Edmundson is a Los Angeles-based insufferable multi-hyphenate. She has written for Bon Appétit, Refinery29, Dwell, and others. In 2013, Edmundson was quoted as saying, "Writing about yourself in the third person is incredibly awkward and also sort of humiliating." This post is a sponsored collaboration between Cayman Jack and Studio@Gawker.